Located 8 miles north of Kendallville on 75 wooded acres. Camping Cabins - Rustic log cabins sleep up to 5 people and include one queen bed, one set of twin bunk beds, table and chairs, fire ring, and picnic table. Electric only inside with water on site. Bring your own linens. 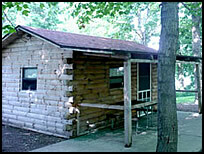 Traditional Cabins - Rental campers parked on a nice shaded site offer all the comforts of home. 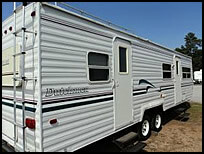 Sleeping 4-5 people, these RVs include a full kitchen (with stove, oven, microwave and refrigerator), booth dinette that converts to a bed, sofa that converts to a bed, separate bedroom with queen bed, full bathroom, and heat and A/C.